Rocco loves to burst into an all out zoom, trot around a bit, explore and sniff, and then repeat. I take advantage of his natural patterns when we go for walks by incorporating a sprint/trot/walk regime -- figuring this type of interval training is a great workout for both of us. Turns out, I'm on to something! According to dog-training expert Mikkel Becker, this interval type movement pattern comes naturally to dogs. 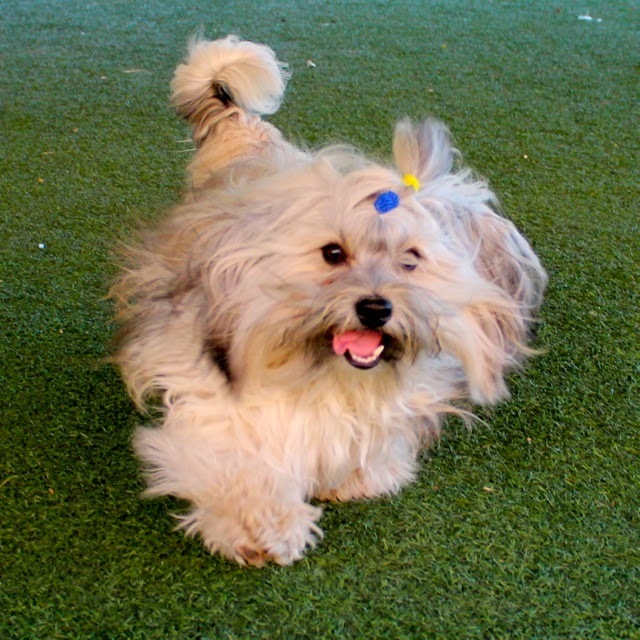 And, she says, it is the best, most effective way to create and maintain fitness in dogs. 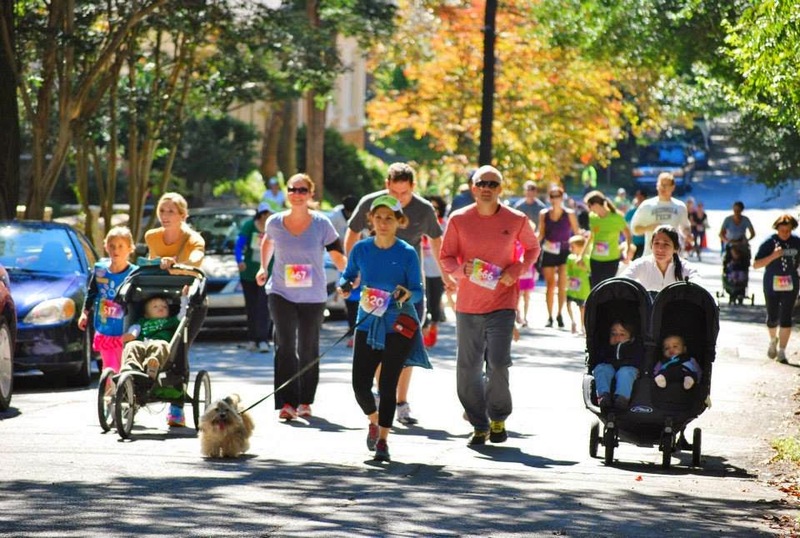 And the best news is, you don't have to be a marathon athlete to incorporate intervals into your dog's exercise routine. Short sprints, hills, and a variety of surfaces (think sandy beaches!) can add some variety to your regular walks and help keep you and your pup fit and healthy. Rocco and I did a combination of trotting, walking and sprinting during a road race last year. Becker, who also partners with Zuke's to provide training tips, shares these tips for interval and fitness training with dogs. Weight. By adding a weighted vest or putting weight in a doggy backpack, you will increase the intensity of your pup’s efforts in their usual activity (i.e. walking, hiking, etc.). Be sure to talk to your vet before doing this to determine not only if your dog is healthy enough for the extra work, but how much weight to use for your dog’s size and energy-level. Sand. If you are near a beach, head that way! 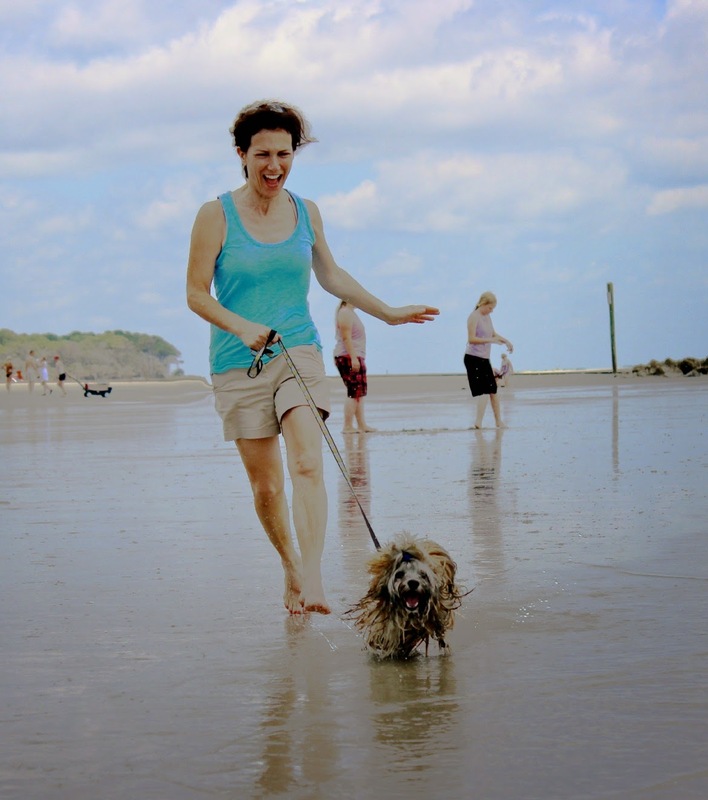 Actually, any terrain that makes it more difficult to move: sand, dirt, uneven terrain, or uphill will add challenge to your dog’s workout and help burn the calories. Chase. Tie a rope around your pup’s favorite stuffed animal and have him chase it. Swing it around, run, toss it out and pull it back mid-air…create your own variation that incorporates the incentive of chasing a beloved toy, and add to the fun! Fishing. Have a retractable leash with a light stuffed animal tied to the end of it. Cast the stuffed animal out and then retract it back, creating a lure for your dog. If you really want to up the ante, lace the stuffed animal with an animal smell, like deer or raccoon, from a hunting supply store. That’ll get ‘em going and provide a ton of motivation to catch that toy! Agility. Create a home agility course for your pup to maneuver. This will not only challenge the body, but the mind, as well. Some ideas: create a tunnel by putting a broom stick over two chair seats then draping a blanket over chairs to make a tunnel, or make weave “poles” with buckets or obstacle cones (you can find these at pet stores). What about holding a hula hoop upright for your dog to walk through, gradually lifting the hoop until your dog is leaping through the air? Be creative and have fun, and your dog will, too! Sprints. Put your dog in a stay and have an object or person a good distance away. Race your dog to get to the object. You are both sure to get in shape with this one! For the rest of Becker's tips, check out her entire series of great tips on the Zuke's Dog Blog. We think her "fishing tip" is a brilliant use for a retractable leash! We also used the "chase" tip to build toy/tug drive (useful for agility). In our version, I tied a flat stuffy toy to the end of a carriage whip and flung it around away from Rocco (kind of like a cat wand toy). Have you tried a version of any of these tips? Speaking of Zuke's, you may have seen our announcement for the next Event Barkers Twitter party, sponsored by Zuke's, on June 22. We'll be chatting about fueling an active dog lifestyle so we hope you'll all stop by and share some tips too! And, if you haven't already, please RSVP on the giveaway widget on our announcement post for a chance to win lots of great prizes from Zuke's! 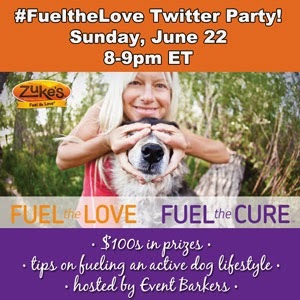 We'll also be talking about how you can help support The Dog and Cat Cancer Fund simply by posting a photo of your active pet on Twitter, Instagram or Facebook and tagging it with #FueltheLove @ZukesPets. For every photo, Zuke's will donate $5 up to $10K to The Dog and Cat Cancer Fund. What are you waiting for? I know you have tons of photos of your pup loving life. Pick one and post it! Oh to be on a beach with sand under our paws. How we long for that, big sigh. All sounds good to us. Have a fabulous Friday. Yes, us too! We want to go back to the beach! Happy Friday! Love all of these ideas...the fishing one especially. Anything that gets you and your pet moving, we are in favor of! We may have to go "fishing" today! Happy FitDog Friday! Oh yes! Stairs are great too! I hear you on needing the break first. Rocco is always ready to go! Very cool! I might have to start doing this with Luna too. She is definitely a natural at intervals. Mr. N has a flirt pole that he plays with. It's a little heavy though. I may have to get one of the cat ones instead. The pic of you two is adorable! Great post. Mom likes to do sprints with us on runs. We jog along and then she says race and we run the 100yds or so to the next light pole as fast as we can, then she says easy and we jog again. Bailie will be learning that soon. First she is adjusting to running in general. Mom has to be sure Bailie has the stamina and that she doesn't trip Mom first. Great Ideas, Ava will chase her toy anywhere and Veruca is much better at the sprints. The fishing idea is interesting. We may have to give that a try. You have some great ideas there. I do interval training naturally 'cause I'm usually off leash...it's the smells that make me stop and take notice. Those are some fun interval ideas. I feel so boring but we do love intervals. I just jog a block or two every five or six blocks. Like I said, boring. I guess we do go from walking to sprinting and back to walking again whenever we visit the beach. I can't help but want to run on the beach and the dogs, well, what else is there to do at the beach but run? Have a great weekend! heehee! Wow! Now that's fast! Those are excellent tips. I wish we had more hills around here to make our walks more interesting. Great tips! We didn't realize that we were already doing interval training this way! Thanks for your great tips. I really needed this. Every freaking dog owner loves to do interval training with their dogs. It's awesome. For fitness info this post too!